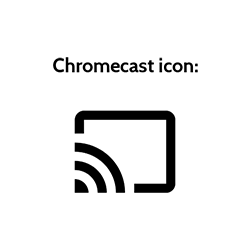 This network employs filters for social media and some other sites, as well as speed restrictions, and is only meant for using presentation tools on campus. Please connect to "CCLC-Guest" for full internet access. You can ask any staff member for the password. If the display is already on and you're ready to use the Chromecast, skip to Step 2. 1. Turn on the screen. The power button is located on the right side of the screen. 2. Press the INPUT button. The input list will appear. Navigate to HDMI 2 using the channel up/down arrows, then press the INPUT button again. 3. The Chromecast screen should appear with the time and room name listed. When you are done casting, please set the screen to HDMI 1 and turn it off. 1. Turn on the screen using the Hannspree remote. 2. Press the INPUT button on the remote, and select HDMI 1. 1. The Classroom display can be moved to any room downstairs in Rice Hall. 2. Turn on the screen using the power button on the right side of the screen. 3. On the silver box directly below the screen, press the CHROME button. 4. The Chromecast screen should appear with the time and room name listed. If you would like to cast media, like videos or music, click here. 1. Open Google Chrome, or click here to install it. If you're using a Chromebook, Google Chrome is already installed. 3. 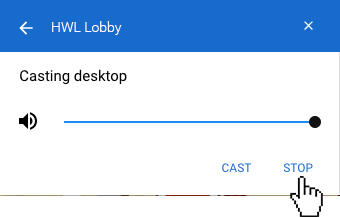 Click the arrow next to "Cast to" to open the drop-down menu, then select Cast Desktop. 4. Select the location of the device you wish to cast to. 5. Click Share in the window that opens. 6. Your screen should now be casted to the display you selected. 1. Click the blue cast icon in the upper right, then click the Stop button. 2. Go to the website you wish to cast from. Many sites are supported, includingYouTube, Google Play Music, Pandora, Netflix, and more. For a full list, click here. If the site you want to share isn't supported, click here to cast your entire screen. 3. Once you're on the website, open the video or music you wish to cast. Find the Chromecast icon in the player, and click it. 5. The selected media should now be playing on the display. 1. Open the app you wish to cast from. Many apps are supported, including YouTube, Google Play Music, Pandora, Netflix, and more. For a full list, click here. 2. Once the app is open, find and tap the Chromecast icon. 3. Select the location of the display you wish to cast to. 4. The media should now be casting to the selected display. Use the controls in the app to control the media, and to stop casting. 1. Open the Google Home app. If you don't have it, download it from the Google Play Store. 3. 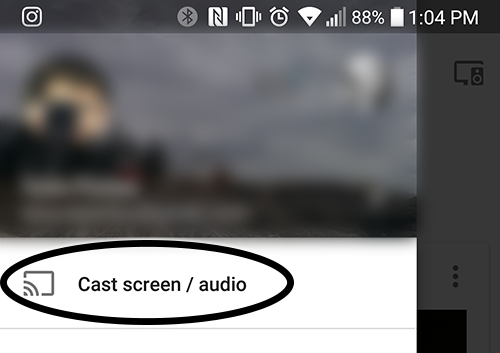 Tap Cast Screen/Audio, then follow the on-screen instructions to select a device to cast to.